Nothing has quite gone as planned this week so I'm behind on posting my gratitudes. When life is hectic, it makes me particularly thankful for the simple things I've been looking forward to. One of those was the CMA (Country Music Association) awards last night. The CMA's is a great show full of music; the awards almost seem like an afterthought. I'm always amazed by the staging. I enjoyed 3 hours of uninterrupted music and TV. Today I'm thankful for my pharmacist. She found a discount coupon for me last month and chased it down again this month. It took the copay from $50 to $4! I would have never known about this so I'm delighted. One of the benefits of a small town are independent stores like my pharmacy with the same people who get to know you and go out of their way to help out. 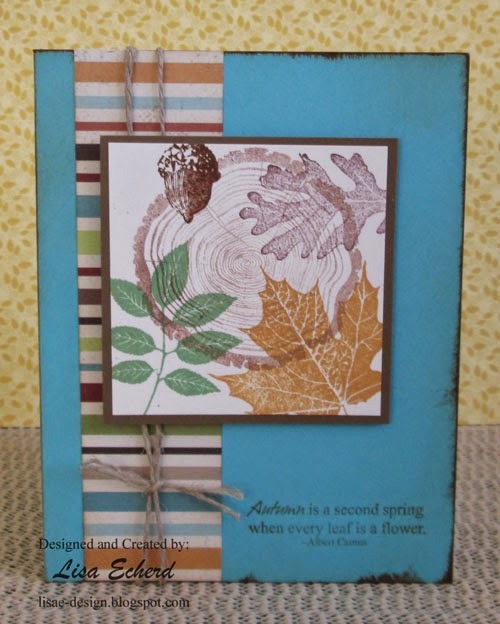 I'm also sharing a card made with the Autumn Splendor set from Raisin Boat. I had to fix a minor 'oops.' At one point I got a bit of brown ink on the right side of the background after I had stamped the greeting. So I used a heavy coat of brown ink around the edges and it all blended together. Beautiful card. Good on you for shopping local and supporting your local stores!